Fulton, Md. 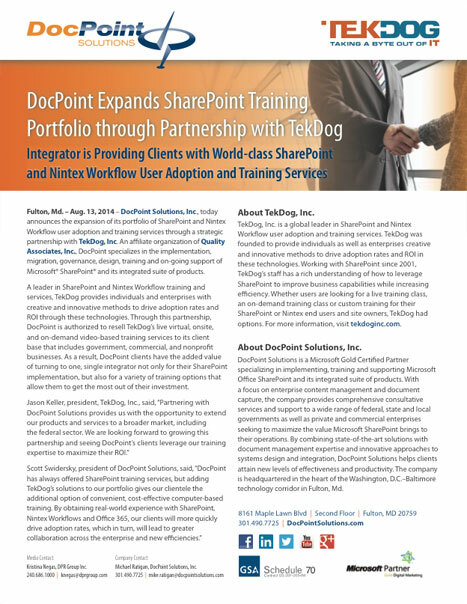 – Aug. 13, 2014 – DocPoint Solutions, Inc., today announces the expansion of its portfolio of SharePoint and Nintex Workflow user adoption and training services through a strategic partnership with TekDog, Inc. An affiliate organization of Quality Associates, Inc., DocPoint specializes in the implementation, migration, governance, design, training and on-going support of Microsoft® SharePoint® and its integrated suite of products. A leader in SharePoint and Nintex Workflow training and services, TekDog provides individuals and enterprises with creative and innovative methods to drive adoption rates and ROI through these technologies. 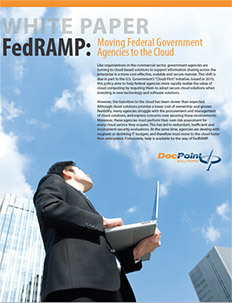 Through this partnership, DocPoint is authorized to resell TekDog’s live virtual, onsite, and on-demand video-based training services to its client base that includes government, commercial, and nonprofit businesses. As a result, DocPoint clients have the added value of turning to one, single integrator not only for their SharePoint implementation, but also for a variety of training options that allow them to get the most out of their investment. TekDog, Inc. is a global leader in SharePoint and Nintex Workflow user adoption and training services. TekDog was founded to provide individuals as well as enterprises creative and innovative methods to drive adoption rates and ROI in these technologies. Working with SharePoint since 2001, TekDog’s staff has a rich understanding of how to leverage SharePoint to improve business capabilities while increasing efficiency. Whether users are looking for a live training class, an on-demand training class or custom training for their SharePoint or Nintex end users and site owners, TekDog has options. For more information, visit tekdoginc.com. DocPoint Solutions is a Microsoft Partner with Gold Competency specializing in implementing, training and supporting Microsoft Office SharePoint and its integrated suite of products. 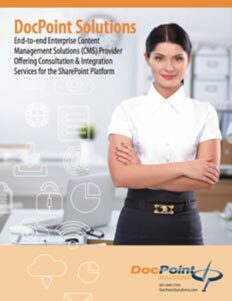 With a focus on enterprise content management and document capture, the company provides comprehensive consultative services and support to a wide range of federal, state and local governments as well as private and commercial enterprises seeking to maximize the value Microsoft SharePoint brings to their operations. 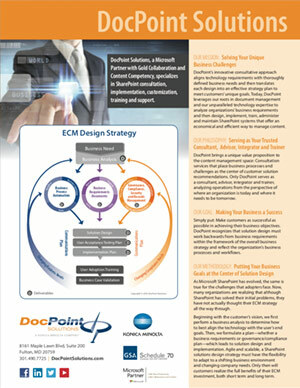 By combining state-of-the-art solutions with document management expertise and innovative approaches to systems design and integration, DocPoint Solutions helps clients attain new levels of effectiveness and productivity. 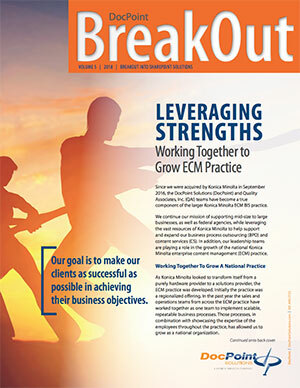 The company is headquartered in the heart of the Washington, D.C.–Baltimore technology corridor in Fulton, Md.